Jan Miense Molenaer (c 1610-1668), A Young Man playing a Theorbo and a Young Woman playing a Cittern (c 1630-32), oil on canvas, 68 x 84 cm, The National Gallery (Bought (Clarke Fund), 1889), London. Courtesy of and © The National Gallery, London. It’s curious that so many of the most frequently and extensively used pigments are also the most poisonous. Not only have painters been dicing with death in using lead white, but for many centuries they used another highly toxic lead salt, lead tetroxide, or Red Lead, albeit in smaller quantities. Red Lead was also one of the earliest synthetic pigments. Although it does occur as a natural mineral, it was probably being made from Lead White about two thousand years ago, in both Europe and China. 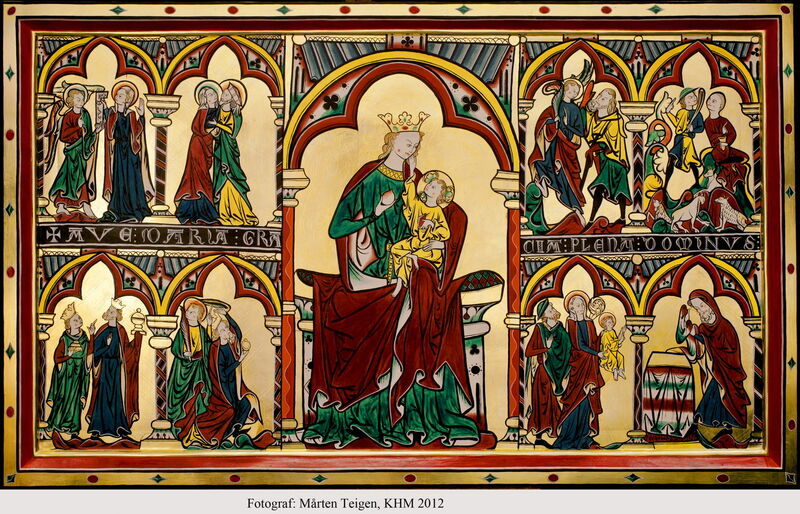 One of the earliest examples of oil painting in Europe, the Altar Frontal of the ancient Norwegian church of Tingelstad dating back to 1275-1300, has been found to contain Red Lead. This is a modern full reconstruction, which suggests quite extensive use. Even older European examples include some of the Roman Fayum funerary portraits, which were made in the period 100-400 CE. As a pigment in most painting media, Red Lead is usually an orange red in colour. When used in fresco or watercolour, it tends to blacken over time, or to develop a dull, chocolate brown hue, probably from its conversion to brown lead dioxide. Used in the drying oils of oil paint, it has generally proved more stable, although it may form lead soaps in the paint layer, which can in turn be associated with structural weakness. In the early Renaissance, Red Lead was already established as one of the fundamental reds of the tempera palette. 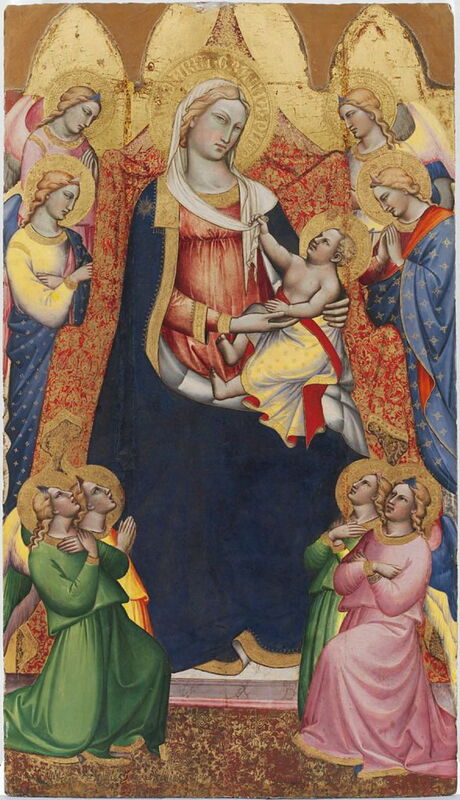 This is shown well in the extensive brighter reds of Spinello Aretino’s Virgin Enthroned with Angels from about 1380. 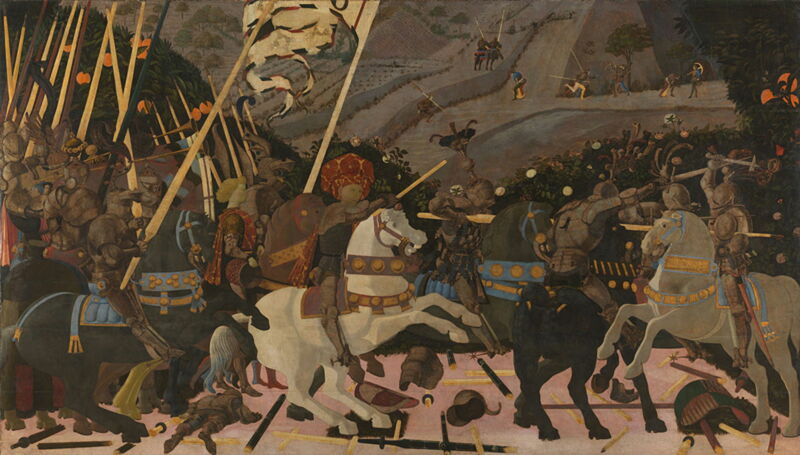 Paolo Uccello also used it in his masterpiece Niccolò Mauruzi da Tolentino at the Battle of San Romano from about 1438-40, where it appears in the bright orange objects at the upper left. In this case, it is in egg tempera combined with drying oils. 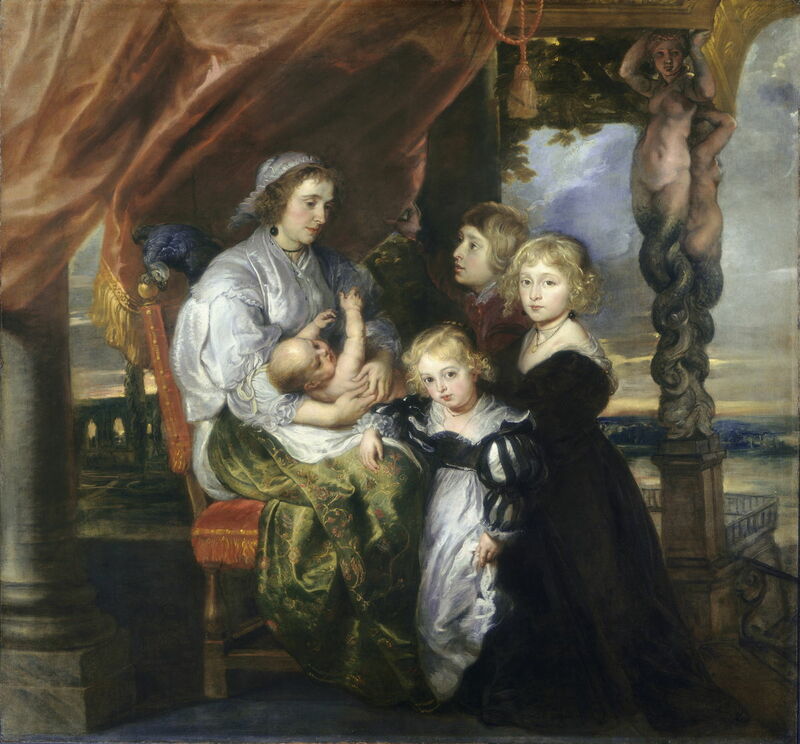 Peter Paul Rubens (1577-1640) and possibly Jacob Jordaens (1593-1678), Deborah Kip, Wife of Sir Balthasar Gerbier, and Her Children (1629-30, reworked probably c 1645), oil on canvas, 165.8 x 177.8 cm, The National Gallery of Art (Andrew W. Mellon Fund), Washington, DC. Courtesy of The National Gallery of Art. Red Lead has been found in Peter Paul Rubens’ Deborah Kip, Wife of Sir Balthasar Gerbier, and Her Children, where it was probably used in the upholstery of the chair, and possibly in combination with other pigments in the drapery at the upper left. This painting has a very complex history. Originally made by Rubens between 1629-30, it seems then to have been reworked by Jacob Jordaens, probably in the 1640s, after Rubens’ death, by which time the infant shown in the arms of Deborah Kip would have been a ten year-old, at least. Red Lead remained in widespread use, both in combination with other red pigments, and alone for colour highlights. 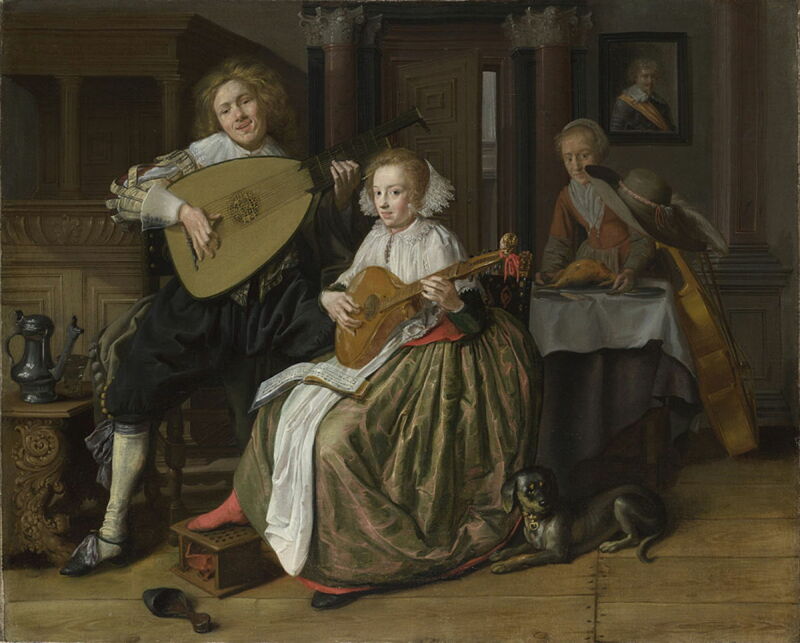 A good example of the latter use is Jan Miense Molenaer’s A Young Man playing a Theorbo and a Young Woman playing a Cittern (c 1630-32), where the young woman’s sock, underskirt, and other details stand out thanks to their orange-red colour. 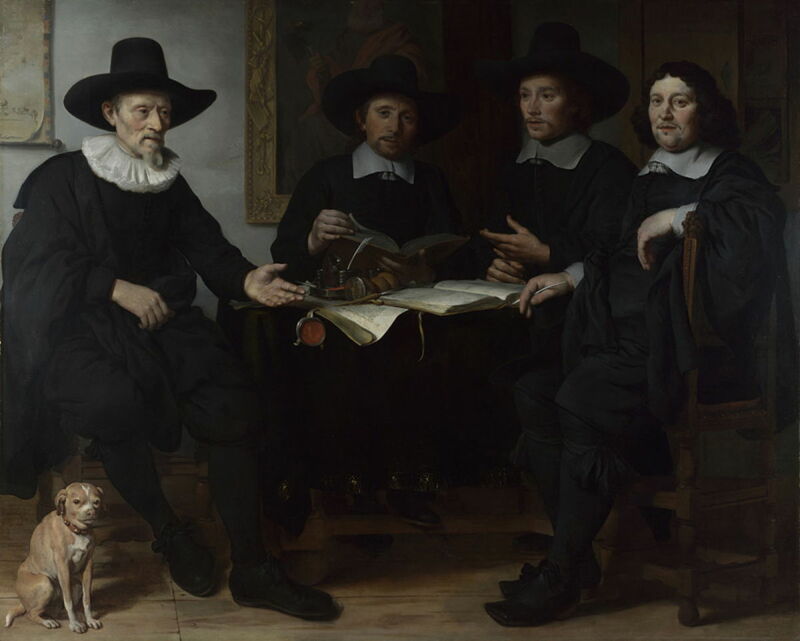 Gerbrand van den Eeckhout (1621-1674), Four Officers of the Amsterdam Coopers’ and Wine-rackers’ Guild (1657), oil on canvas, 163 x 197 cm, The National Gallery (Bought, 1895), London. Courtesy of and © The National Gallery, London. It also appears in the red of sealing wax in Gerbrand van den Eeckhout’s Four Officers of the Amsterdam Coopers’ and Wine-rackers’ Guild (1657). Rembrandt van Rijn (1606-1669), Self-Portrait (1659), oil on canvas, 84.5 x 66 cm, The National Gallery of Art (Andrew W. Mellon Collection), Washington, DC. Courtesy of The National Gallery of Art. Many of the Old Masters used Red Lead in more complex paint layers and mixtures. 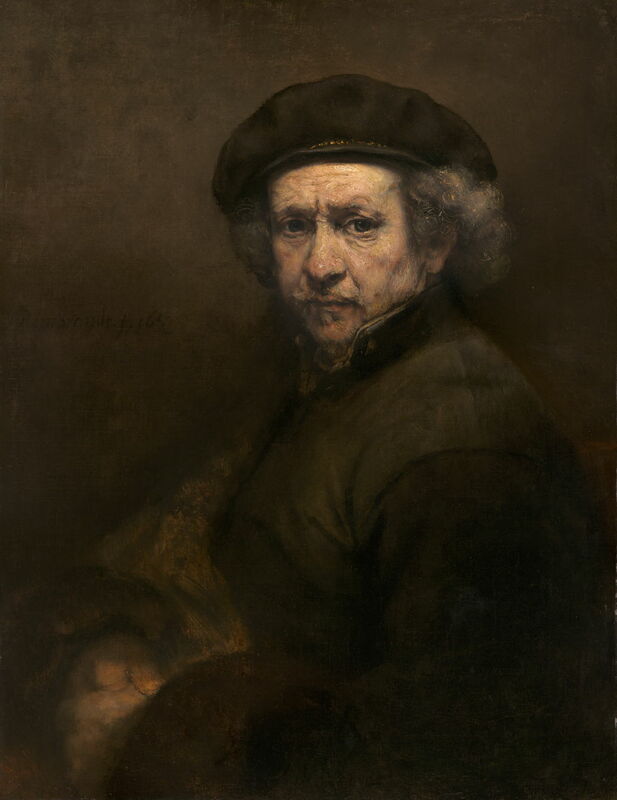 It makes an appearance in the flesh of Rembrandt’s Self-Portrait from 1659. There was only limited progress in the discovery of alternative red pigments well into the nineteenth century, when cadmium salts became available. 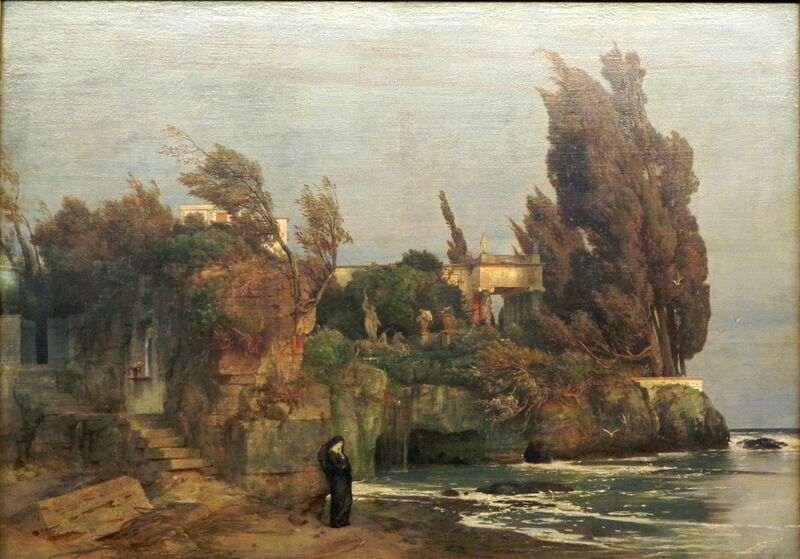 Arnold Böcklin (1827–1901), Villa by the Sea II (1865), oil on canvas, 123 x 173 cm, Sammlung Schack, Bayerische Staatsgemäldesammlungen, Munich, Germany. Wikimedia Commons. The red stains of the low cliffs in Arnold Böcklin’s second version of Villa by the Sea from 1865 are made using Red Lead. 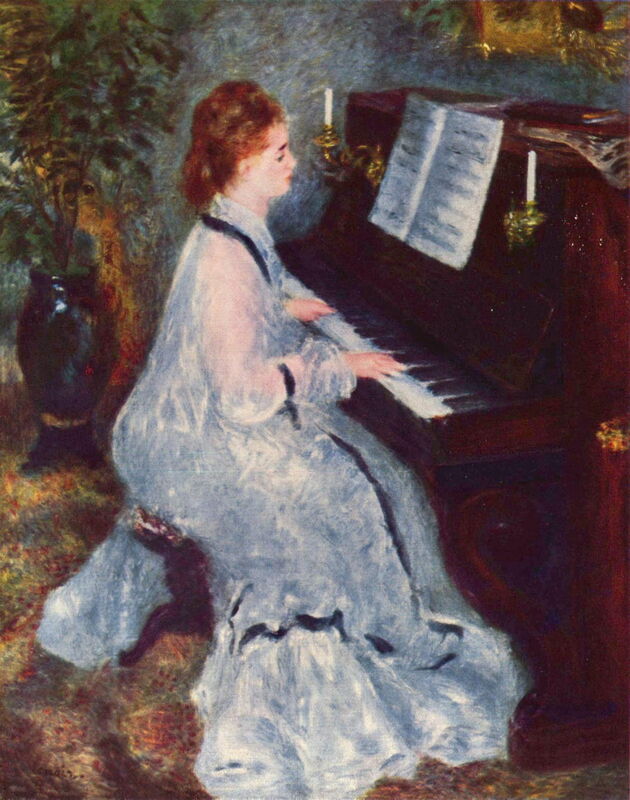 Pierre-Auguste Renoir (1841–1919), Woman at the Piano (1875), oil on canvas, 93 × 73.5 cm, Art Institute of Chicago, Chicago, IL. Wikimedia Commons. Pierre-Auguste Renoir used Red Lead in the portrait of a Woman at the Piano in 1875. Medical and scientific developments in the latter half of the nineteenth century brought greater understanding of lead’s toxicity, but its pattern of use seems to have changed quite little. It is hard to know now quite why Red Lead was so slow to be removed from the palette. Vincent van Gogh (1853–1890), Plain near Auvers (1890), oil on canvas, 73.5 x 92 cm, Neue Pinakothek, Munich, Germany. Wikimedia Commons. 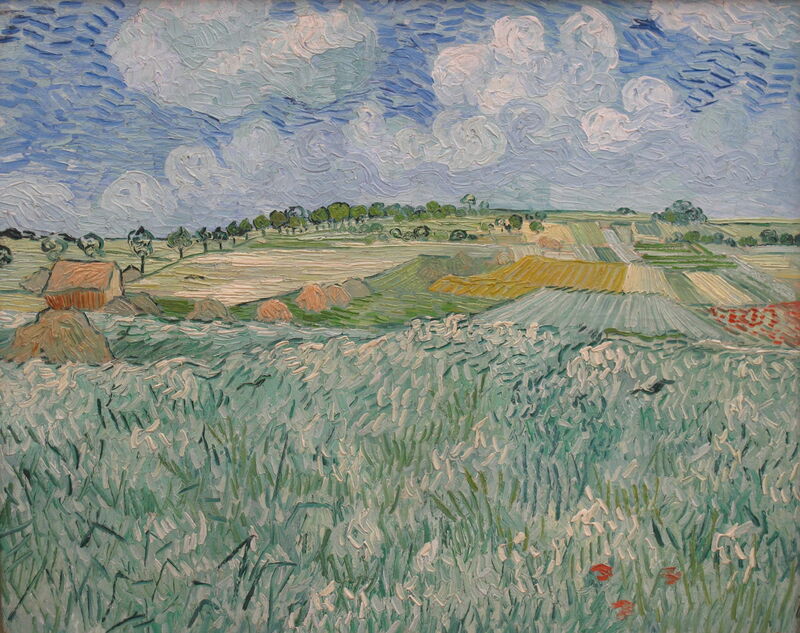 Vincent van Gogh’s Plain near Auvers from 1890 is a good example of the confusion which had arisen. Van Gogh was novel in his use of Chinese White as a non-toxic alternative to Lead White. Oddly, though, as van Gogh was replacing toxic lead in his whites, he continued to use other lead salts in his reds, which here include Red Lead, albeit in small parts of his canvas. During the early twentieth century, Red Lead fell from favour completely among fine arts painters, who had only ever accounted for a small proportion of world total pigmemt production. It remained common in decorative and protective use until the later half of that century, in particular for its use to protect ferrous metals from rust. During the 1960s it was still very popular on all ferrous metal which were liable to rust. Perhaps its most fortuitous use was in miniatures and illumination in books, where the pigment impregnated the book’s pages, protecting it from attack by silverfish and other pests. One man’s paint is another pest’s poison. Elisabeth West Fitzhugh (1986) Artists’ Pigments, vol 1, ed Robert L Feller, Archetype. ISBN 978 1 904982 74 6. Posted in General, Life, Painting, Technology and tagged Aretino, artists paints, Böcklin, history of painting, Molenaer, painting, pigments, Rembrandt, Renoir, Rubens, Uccello, van den Eeckhout, van Gogh. Bookmark the permalink. While red lead is seriously poisonous, cadmium red is among the most toxic in modern paints. Cadmium red has airborne toxic qualities, as well. I use the less vibrant, but still “red”, primary magenta as an alternative. In practice, cadmium pigment is not a threat to the artist except in pastel dust. This is because it is absorbed so poorly from ingested paint or through skin contact. Unfortunately, lead salts are rather better absorbed, so in practice are highly toxic by any route. Environmentally both lead and cadmium are very serious concerns, because of their concentration in sewage and cumulative effect on agricultural land.